CHEYENNE – The Wyoming Department of Education (WDE) announced Tuesday the Wyoming Cowboy ChalleNGe Academy (WCCA) in Guernsey received its educational accreditation from AdvancedEd, a national non-profit organization that accredits educational institutions based on standards of quality. Of all the National Guard-sponsored ChalleNGe programs, WCCA is the seventh academy to gain full accreditation. Credits students earn while attending WCCA are now more easily transferable back to students’ home school districts and will count toward graduation. Several Wyoming schools are AdvancedEd accredited in addition to state accreditation. “I am thrilled to see the Wyoming Cowboy ChalleNGe Academy gain accreditation,” said State Superintendent of Public Instruction Jillian Balow. “WCCA gives each cadet who chooses to attend the academy the opportunity to explore many careers and trades, all while achieving their GED or earning credits toward a diploma. “We’ve been working toward accreditation for some time. I’m pleased our staff’s hard work allows us to continue to provide our state’s at-risk youth an alternative to dropping out of school, while partnering with Wyoming school districts to ensure they are college, career, and military ready,” said Major General Luke Reiner, Wyoming’s adjutant general. The mission of the Wyoming Cowboy ChalleNGe Academy is to provide a safe, disciplined and professional learning environment that empowers non-traditional learners (ages 16-18) to improve their educational level and employment potential and become responsible productive citizens. The WDE has developed a fact sheet to help answer questions school district might have, such as how this accreditation impacts districts when a student attends WCCA, then transitions back to his or her home district. This document will be updated as necessary. For more information about the WCCA, visit wycowboychallenge.org. 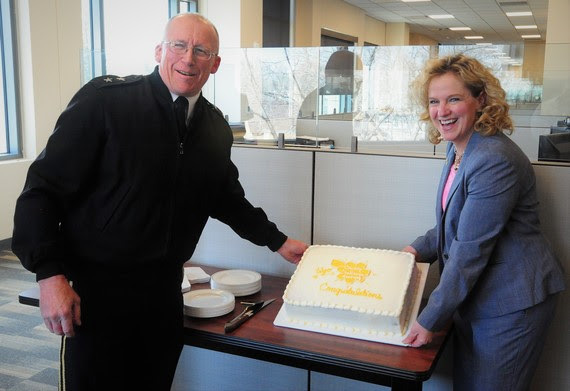 Major General Luke Reiner, Adjutant General for Wyoming, and Superintendent of Public Instruction Jillian Balow celebrated the WCCA’s accreditation with a cake ceremony at the WDE offices Tuesday.